The media reports and the Asian Human Rights Commission (AHRC) indicate that it was here that Mr. Abdul Sattar Umrani, a brother of Mr. Sadiq Umrani, a Baluchi tribal leader and a serving PPP provincial minister, came with more than six men and abducted five women at gun point. They were transported in a government vehicle to another remote area, Nau Abadi, near Baba Kot. Upon reaching Nau Abadi, Abdul Sattar Umrani and his men took the three younger women out of the jeep and beat them before opening fire with their guns. The girls were seriously injured but were still alive after the shooting. Sattar Umrani and his men pushed them into a wide ditch and covered them up with dirt and stones. 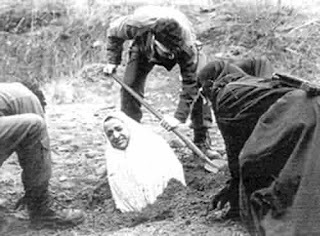 When the two older women protested and tried to stop the burial, the attackers also pushed them into the ditch and buried them alive. After completing the burial, they fired several shots into to the air so that no one would come close and left the scene. According to media reports, the five female victims were Fatima, wife of Umeed Ali Umrani, Jannat Bibi, wife of Qaiser Khan, Fauzia, daughter of Ata Mohammad Umrani, and two other girls, aged between 16 to 18 years, whose names have not been published. At the moment they were abducted, the women were preparing to leave for a civil court at Usta Mohammad, district Jafarabad, so that three of the girls could marry the men of their choice. Their decision to go to to court for a civil marriage was contrary to the wishes of the elders of the tribe. The live female burials took place a month ago but the police have neither registered a crime report nor taken any action. There have been no arrests yet. Minister and tribal chief Sadiq Umrani confirmed the incident took place but insisted that only three women had been killed by unknown people. 1. Because it involves a medieval style live burial of five females by their fellow members of the tribe. 2. There was an attempted cover-up by a government minister whose brother used a government vehicle in committing the crime. 3. At least two Pakistani senators from Baluchistan, including the current acting chairman of the Senate, spoke on the Senate floor in support of this "Baluchi custom". According to the Nation newspaper in Pakistan, Baluchistan's Senator Israr Ullah Zehri (also a tribal chief) defended the terrible atrocity in Baba Kot. While aggressively interrupting Senator Bibi Yasmin Shah, who condemned the brutal act of burying alive five women in Baluchistan on charges of 'love marriage', said it was part of their traditions, which, he said, should not be negatively highlighted. Talking about tribal justice in Baluchistan, I am reminded of a book titled 'The Tigers of Balochistan', written by Sylvia Matheson (published 1967), that epitomizes the Baluchi chieftains' approach to life. Late Nawab Akbar Bugti (killed by Pakistani military in 2006), who was twenty-one when Matheson spoke to him in the 1960s. She was questioning him on his casual statement to her, reminding her that he had killed his first man at the age of twelve. "About this man you killed — er, why?" "Oh that!" he responded as he sipped his tea, "Well, the man annoyed me. I've forgotten what it was about now, but I shot him dead. I've rather a hasty temper you know, but under tribal law of course it wasn't a capital offense, and, in any case, as the eldest son of the Chieftain I was perfectly entitled to do as I pleased in our own territory. We enjoy absolute sovereignty over our people and they accept this as part of their tradition." The scourge of honor killings, however, is not limited to Baluchistan alone. Such barbaric and brutal murders are not uncommon in many parts of Pakistan, India (The Sikhs engage in it too) and the Arab and the Muslim world. The problem seems to stem from a distorted sense of honor and shame and deep-rooted misogyny found in all parts of the world. Some Hindus, too, routinely commit female infanticide by either aborting female fetuses or killing live born girls. The Chinese are reported to engage in the terrible practice of female fetus abortion and infanticide because of the government's one-child policy. As a result, there is a growing imbalance between male and female populations in India and China, an unhealthy trend for society. In almost all instances, such killings are sanctioned not by law or religion but by local customs and legitimized by courts which routinely acquit the perpetrators. This problem has much deeper roots than just the ordinary crimes or the problems of feudal or tribal excesses. It is a particularly huge concern in Pakistan where the "democratic, civilian" governments are dominated by feudal and tribal leaders who accept honor killings as routine and legitimate. Having been raised in a system of arbitrary rule, these leaders in power do not have any understanding of the fundamental human rights of life and liberty or the concepts of rule-of-law or of due process. Fighting this terrible tradition of unjust killings will require a much bigger campaign than the one that toppled President Musharraf. Such a campaign will have to challenge not just an individual dictator, but defeat the power of feudal-tribal system and end evil social customs that continue to deny basic human dignity, political and economic justice, and genuine freedom to the vast majority of rural and urban Pakistanis. I encourage my readers to visit AHRC website and urge Pakistani leadership to fully investigate honor killings and bring perpetrators to justice. The petition campaign may or not be effective, but we should all try, nonetheless. When submitting the AHRC online appeal to the government leaders in Pakistan, please change the subject slightly to avoid the risk of being blocked as unsolicited bulk mail. I think..the honor killing thing is a descendant practise of Turks incorporated later into middle-east and south asia.Just to nit-pick on something you said, when you specifically mention some "Hindus" do infanticide, it translates to sort of a religious practise by "Hindus" where there is none. "People in parts of India" would have been succinct ;-). The female misogyny is more about economics..the social and economic costs of raising a girl child is absolutely scary for parents in immature social setups.Girls are frequently harassed by eve-teasers in sexually repressed countries like India, then there is biased honor "thing" where girls are saddled with all the "honor liabilities" and not to mention dowry system which is the final nail in coffin of women's empowerment. In Haryana, a married couple was slaughtered for marrying outside the tribe by family and the strangest part is that police and regional govt looked the other way even under media pressure. I don't know whether Baloch story is a propaganda piece or not..but the tribal system where such oddities are detected, the govt must intervene to demolish their social structure through massive education campaign and iron fist. I don't believe any religion or law sanctions honor killings. It's mostly misguided tribal culture and social customs that allow such brutality against women that must be stopped by all means necessary, including education and strict law enforcement. There can be no human rights, democracy and justice unless half of humanity is treated as equals with the other half. I was just about to post about this topic in my own blog I see there is no need now. Successive Pakistani governments have tried to keep the peace in Balochistan by sharing gas and other royalties with tribal chiefs, particularly the three big ones called Bugti, Marri and Mengal tribes. Unfortunately, this strategy has not worked. There has been neither peace nor development as the chiefs squander the money and continue to demand more. Not only that, they deliberately try and keep their people backward to preserve the reprehensible tribal system that denies basic human rights to their people. As long as the fed govt continues to be blackmailed by the Baluch sardars, there is no hope for the ordinary Balochis. Riaz: the details are particularly shocking. These oppressive customs themselves have been in place for a while. On a tangential note, interesting to hear a view of the Baluch sardars that is balanced but still highlights their oppressive systems. No Pakistani commentator - that this reader has followed - has effectively presented that side of the story. Short of restructuring their society there is no hope for this insurgency to disappear. Add India's "interest" in Balochistan as a quid pro quo for Kashmir, the Pathan influx into Quetta and an insurgency that never truly died out, and the scene in Balochistan looks particularly bleak. While I agree with you that "short of restructuring their society there is no hope for this insurgency to disappear", I am sure you recognize that restructuring societies is a monumental task that often requires war. Just think of how Japan modernized by fighting the Samurai culture, as well depicted in the movie, "The Last Samurai". However, unlike Baluchistan, the issues of ethnicity and regionality did not confuse the issues in Japan, as the Japanese society is fairly monolithic and uniform. While I agree that varying degrees of political and ethnic prejudices and misogyny persist in many parts of the world including Europe, Africa, Asia, Arab and Muslim worlds, don’t you think that the local and national leadership has a very special role in influencing social behaviors? Wouldn’t you also agree that misogynistic attitudes and atrocities are far more common in patriarchal feudal and tribal cultures than elsewhere? If you do agree, then addressing feudal and tribal reform is a very good place to begin to address the issues of human and female rights and dignity in Pakistan. As is often said, “the squeaky wheel gets the grease”. I think we should stop being politically correct and call a spade a spade to seriously challenge the status quo in Pakistan. We must take on those that are the most responsible for human degradation and abuse of the vast majority of rural/tribal folks. Democracy can not coexist with the current feudal and tribal systems in Pakistan or any where else in the world. We must, therefore, work on emasculating feudal and tribal power to usher in genuine democracy and human dignity for all people. Pakistan's Senate has now passed a formal resolution on the deaths, according to media reports. "This house condemns the brutal murder of five women in Balochistan's Nasirabad district and calls for strong action to be taken against the culprits," the statement said. It asked the Senate's human rights committee "to produce a comprehensive report on the incident in one month". When my father was the Commandant of Kalat Scouts representing the Pakistan Army, based in Khuzdar, he used to tell me stories of these greedy and stubborn Tribal leaders. This was 28 years ago. Seems like nothing has changed since then. Total annhilation of this Tribal system is the only way out of this illiterate mess. Thanks for the article, Riaz! Remember Senator Mir Israrullah Zehri? A few months ago the senator defended the crime of burying women alive by arguing in the upper house that "It is a Baluch tribal tradition and we have to respect it". Well, the "esteemed" senator has now been promoted to a federal minister position as a reward for his support of Zardari's PPP government. Is this a signal that there is no end to continuing oppression of the poor and the powerless, including women in Pakistan? Is this the "democratic rule" that Pakistanis yearned for and voted for? I'm afraid so. Pakistan has been in a downward spiral on all fronts lately: the economy, the rule of law, national security, terrorism, roti, bijli, paani, etc. etc. As is often said, "Fool me once, shame on you. Fool me twice, shame on me." As many as 13 young girls have been bartered to settle a blood feud between two tribes in Dera Bugti district of Balochistan, officials and tribal elders said on Monday. The girls — aged between four and 16 — were given in Vani by a tribal jirga which arbitrated a five-month-old blood feud between the Baloch tribes of Masoori and Shahwani Masoori. Both are sub-clans of the Bugti tribe. Mir Tariq Masoori Bugti, a lawmaker in the Balochistan Assembly, is said to have conducted the jirga, which was attended by tribal elders and notable locals, in the Baikar area of Phelawagh. Due to conflicting statements, the date of the Jirga is still not clear. Two tribal elders, however, told the BBC Urdu Service that it was either convened on September 3 or 4. According to them, Masoori tribesman Roshan Khan had murdered Mira Khan, a Shahani Masoori tribesman. The jirga declared Roshan Khan guilty and ruled that his tribe give 13 girls in Vani to the offended family besides an Rs3 million fine. Vani is a tribal custom in which girls are forcibly married off to settle tribal feuds. A senior official based in Dera Bugti confirmed the girls were bartered and that they were aged between four and 16. Mir Sarfraz Khan Masoori Bugti, a cousin of Mir Tariq, also concurred that the lawmaker convened the jirga and that the girls given in Vani were less than 16 years of age. Condemning the morbid tradition, Mir Sarfraz called upon the chief justice of Pakistan to take suo motu notice of the incident. According to Ghulam Nabi Shahani, an elder of the Shahani Masoori Bugti tribe, several participants of the jirga have also confirmed the harrowing episode. Mir Tariq, however, has denied conducting any jirga despite reports that the first tranche of the Rs3million fine has already been paid to the offended party. Interestingly, Mir Tariq defended the jirga system’s reconciliatory powers. According to him, it helps resolve local feuds and maintain peace and harmony in the society. Following media reports, Dera Bugti’s Assistant Commissioner Qasim Naveed Bugti formed an inquiry committee headed by Tehsildar Atta Muhammad to further probe the matter. KHYBER PAKHTUNKHWA, PAKISTAN—At only 12, Nazia lives in expectation of the worst. As I step through the doorway of the humble compound her parents share with two other families in the Pashtun lands of northwest Pakistan, her small, fragile body trembles unwittingly. She knew I was coming, but learned too young to trust no one. Nazia was only 5 when her father married her off to a much older man, a stranger, as compensation for a murder her uncle had committed. The decision to give the little girl away as payment, along with two goats and a piece of land, was made by a jirga — an assembly of local elders that makes up the justice system in most of Pakistan’s and Afghanistan’s tribal areas, where conventional courts are either not trusted or nonexistent. Nazia was too young to understand what was happening when that man dragged her into the darkness. But she knew enough to realize something was terribly wrong. “I resisted, I cried and tried to hold on to the door jamb,” she remembers. Nazia was taken to the jirga, displayed as a commodity before the circle of men and examined by the husband to be, who was allowed to decide whether she was good enough to be his wife. Nazia remembers the men staring at her deep brown eyes, her long, black hair — the humiliation of that scene is so utterly marked in her memory that she can barely finish the sentence before dissolving in tears. The men in her family argued, unsuccessfully, that she was too young to be married off. In a rare decision, however, the jirga agreed the girl should not be handed over immediately. So the demanding husband would have to wait — and so has Nazia. Even among the women in the house, she wears a full-length black chador, as if a male intruder could suddenly enter that door again. She is terrified of growing up. Her parents have been able to postpone their daughter’s fate — but not for much longer, certainly no later than age 14. Most child brides are pregnant by then. According to tradition, the compensation — a custom known as swara in Pashtun — should end the dispute and bring the two warring families together in harmony. In practice, however, the marriage only provides cover for revenge. Swara girls become the targets of all anger and hatred in their new home. They are often bitten, emotionally tortured and sometimes raped by other men in the family. They are made to suffer for a crime they did not commit. The swara custom is a form of collective punishment. Nazia’s uncle — the perpetrator of the crime for which she is to be punished — killed a neighbour in a land dispute and then ran away. He left no children, so the jirga decided his older brother should pay in his place by sacrificing his own daughter. Bugti's own words reported by Sylvia Matheson are an indictment of the entire tribal culture of oppression and murder that Balochi Senator Israrullah Zehri rose to defend on Pakistan's senate floor.